An African or person of African descent traveling or living in Italy, and reflecting on personal experience, might wonder how the African continent and its peoples have been imagined by Italians across time. Since my field of teaching and research is the Italian Renaissance, I have been drawn back to that period of roughly 1450-1630. There are two types of sources to plumb for this historical information: learned histories, world maps, records of reputed travels in Africa by European and Islamic travelers on the one hand; memoirs, reports or travelogues, which are documents recording actual experience with Africa and Africans by explorers, traders and travelers on the other. Learned sources of the type familiar to Renaissance humanists extend back in time to Greek and Roman antiquity, to Herodotus, Pliny the Elder, and Ptolemy. Non-elites, especially sailors, would also have relied upon coastal navigational maps, portolani, and their personal experiences in face-to-face encounters as travelers. We must remind ourselves that in this remote time period there was no Italy, no Europe. Instead, the people defined themselves as Christians, and all of the polities of Europe formed a bastion of Christendom. Beyond that self-designation, Italians lived in a geographical space called Italy which, in ancient Rome, had once raised a great civilization. But in the Renaissance, a patchwork of polities produced many races or razze, who also spoke many languages (local dialects). These groupings cordially disparaged each other. The Florentines, Pisans and Sienese shared a mutual dislike for each other that was expressed in racialist terms. Africa and its peoples were seen in much the same way—as a geographical space containing many different peoples (and some mysterious monsters), whose dominant religion was Islam, the great external enemy of Christianity. Nonetheless, by the eleventh and twelfth centuries Italians reestablished contact through trade with the coastal peoples and cities of North Africa, which to them was known as Africa or Libya, while the vast area below that northern strip was referred to as Ethiopia or “land of the blacks.” No one knew for sure how far to the south Ethiopia extended; it was known that there was a torrid equatorial zone, perhaps too hot to past through, separating the northern hemisphere from a possibly desolate southern one, unpopulated by man or beast. During the Renaissance the knowledge produced by contemporary experience began to challenge then replace the earth-centered Ptolemaic cosmology and geography sanctioned by the Catholic Church. Nautical adventures, financed by the Portuguese kings, in ships captained in at least one case by Italians, produced real knowledge of the coastal areas and its peoples that grew from about 1440 on. In the fifteenth century, two of these merchant adventurers were the Venetian Alvise Ca’ da Mosto, known as Cadamosto, who captained two Portuguese ships to the coast of West Africa (1454), and an Italian businessman named Antonio Malfante about whom we know nothing other than what is in a letter of his to a Genoese friend describing his journey into the interior of West Africa across the Sahara (1447). How did these adventurers organize and represent their experiences? First hand knowledge of the interior of Africa was scarce, largely because African peoples kept the voyagers bottled up along the sea coasts. With Vasco da Gama’s voyage around the Cape of Good Hope in 1487, by 1507, Europeans began to produce accurate geologic maps of the coastal areas. This lack of first hand knowledge of the physical features of the interior of Africa/Ethiopia created a blank space that was peopled by monsters in the learned literature: The Blemmyae, beings in human form except that they had no heads, their facial features being in their chests; Troglodytes, who lived in caves deep in the interior; Pygmies and giants. Clearly, not all African peoples were monstrous, as the Greeks and Romans had known, and as the Italians knew from their business dealings with North Africans. But the lack of knowledge about the inhabitants of the interior regions inspired the imagination when it came to beings. Maps left the interior blank except for clouds and a mountain or two. The African interior remained featureless until the nineteenth century. On the other hand, the Portuguese and the Italians, through systematic exploration, commented on the coasts and the climate, the land and its products, the coastal peoples and their customs. Cadamosto commented on the desert dwelling Tuaregs whom he noted were brown, and that their religion was Islam. The Italian adventurer next encountered the blacks of Mali (in southern Mauritania) who were engaged in the gold-salt trade with “fantastic” blacks further to the south, probably the Lobi people. Cadamosto also encountered and wrote about a coastal branch of the Kongolese Ubangi people, noting particularly the characteristic Ubangi lip plate. They supplied gold for the trans-Saharan trade, spoke not at all, and were judged to be very timid. Alvise put the Ubangi into the category of medieval monsters, with their hugely distended lower lips, blood red gums and teeth. His ship then passed further down the coast to the Senegal River, which he mistakenly believed to be a branch of the Nile, its head waters located in Ethiopia. There Cadamosto met the Wolof (Jalof) people, who were black but possessed well formed bodies, living in a land with green trees and fertile valleys. The Venetian encountered the Wolofs of the city of Cayor, with whom he struck up a trade relationship; as a consequence, he noticed many aspects of their economic practices, political organization, and clothing. He also took a few to his ship, where he demonstrated how to make candle wax from bee hives, after harvesting the honey. Cadamosto made two trips further south and up the Gambia river, engaging in a battle with the Mandingo people the first time but succeeding in establishing a trade relationship the second. The Venetian captain, in the service of the Portuguese monarch, noticed much about the African peoples whom he encountered; even though lacking a proper framework to understand all that he saw; his curiosity made him unique among Portuguese sailors whose accounts of their travels reflect little interest in people, focusing only on inventorying items that could be exploited for trade. In contrast with Cadamosto, Antonio Malfante claimed to have traveled to West Africa from the Barbary Coast across the Sahara. The one letter that we have from him is written in Latin, which indicates a high level of education and familiarity with classical sources. Malfante writes that he encountered the Tuaregs who were Muslims, and whom, he wrote, had never seen a Christian man before, though there were many Jews there in the oasis of Tuat. His primary cultural distinction was a religious one, not skin color. Antonio was told by an informant, allegedly from Timbuctu, about the lands and peoples further to the south but does not claim to have traveled there himself. Here his letter includes “information” that related to the reputed uncivilized state of the natives (for example, the allegation that they engaged in sexual acts in public, and had no structured families) that were of a piece with the derogatory images in classical and medieval sources. His letter contains many misstatements about Timbuctu, calling into doubt whether there actually was an informant. Antonio related that there were no impressive buildings or books in Timbuctu but we know that the famous Mosque there had been built in 1350 by Mansa Musa, and that the city was a center of Koranic education. Today, Timbuctu’s rich store of medieval manuscripts in private libraries is today being conserved by scholars. Malfante did accurately list many cities to the south, peopled by blacks, whose names would enter general circulation in Europe by the sixteenth century. By the sixteenth century and beyond, real knowledge of Africa and its peoples would grow in Europe. Malfante, who may well have never been in Africa himself, remained tied the classical view of Africans as inferiors in every way to Europeans; but Cadamosto was different in that he was willing to withhold value judgments even when confronted by previously unknown black peoples in Senegal and Gambia. Alvise’s view was “possible” because the culture of Venice, based in part on classical affinities, was also based on pragmatism and openness to learning from experience, gained in trade with many different peoples. It is perhaps not surprising that an Italian author, Cinzio, could write a novella about a valiant Moorish sea captain who comes into the employ of Venetians and marries a Venetian noble woman, with tragic results. On that story Shakespeare based his play, Othello. 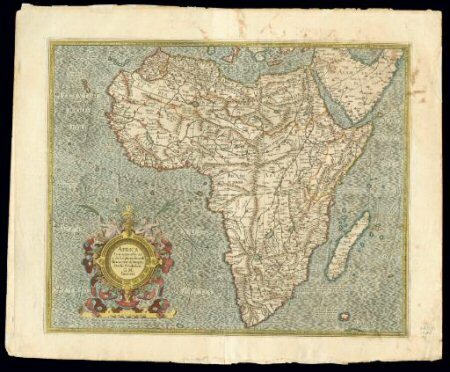 John K. Brackett, "Africa and Africans in the Imagination of Renaissance Italians," in ItaliAfrica: Bridging Continents and Cultures. Sante Matteo, ed., (Stony Brook, New York: Forum Italicum Publishing, 2001; G. R. Crone, ed. and trans. The Voyages of Cadamosto and Other Documents on Western Africa in the Second Half of the Fifteenth Century (London: The Hakluyt Society, 1937); Katherine George, "The Civilized West Looks at Primitive Africa, 1400--1800" Isis 49 (March 1958).